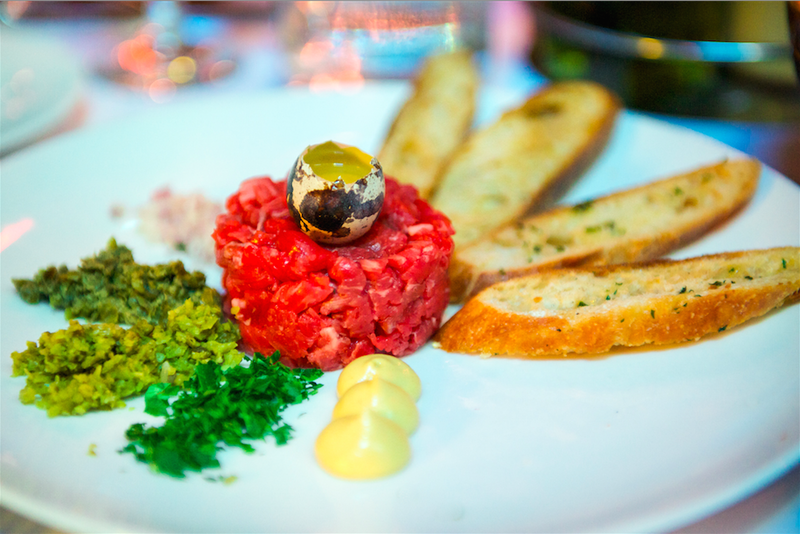 Steak tartare is of course a raw beef dish; fresh beef (it MUST be fresh and well trimmed of fat and sinew) is cubed and seasoned, and often served with crispy toast or some variety of crispy potato. Seasonings can be incorporated in advance or mixed at the table by the individual diner. This is a fairly classic version of Steak Tartare that you could use for reference if you want an idea of the seasonings typically used. But I have to make a confession. I’ve never actually eaten this dish at a restaurant or prepared it myself at home. It’s one of those dishes where preparation and quality of ingredients are key, and it’s easy to be put off by tongue-in-cheek commentaries like this one, that highlight the dangers of preparing your own tartare at home. As for restaurants, well, food fashions come and go, and this particular French bistro staple isn’t something that’s so commonly seen on the menu of Sydney restaurants these days, even when they specialize in French cuisine. I have eaten plenty of other ‘raw’ dishes though, drawing on the diverse culinary influences of the melting pot that is Australia’s restaurant culture. I’ve had thinly sliced raw beef served Japanese style (Beef Tataki), as well as plenty of Japanese raw fish and seafood (sashimi). I’ve enjoyed beef carpaccio and tuna tartare, and on visits to New Caledonia and Vanuatu I fell in love with their version of a citrus cured coconut raw fish salad, Tahitian salad (Poisson Cru). I have yet to try South America’s ceviche but it’s on my list! The main thing I’d always stress is that fish, meat, or whatever you’re eating, if it’s to be prepared this way, MUST be fresh. Tell me, are you squeamish about eating raw meat? Or, if prepared correctly, would you give it a go? P.S. For those who are wondering, yes, I’m currently working on the next title in the Dark Child series, which will continue from where Covens Rising concluded. It should be available in 2015, and I’ll post more details when I have them!